It's not often my mind gets blown on a Hidden New Jersey jaunt. We see a lot of wonderful things and meet many interesting people in our travels, but it's rare that a visit to one place gets me so excited that I don't know where to start the story. This is one of those instances. It started a couple of weeks ago, when I traveled Route 57 through Warren County to find remnants of the old Morris Canal. Once-busy port towns revealed small pieces of their past, while a wrong turn outside of Montana brought me to a lonely stretch of the canal hidden in the woods of Scott's Mountain. As interesting as it all was, something was missing: the actual mechanical workings of the canal. Without that, you're just looking at a series of long ditches. Yeah, they're historical, but they show no indication of why the Morris Canal was such a big deal. And it was a big deal, and still is now, 90 years after it went out of business. 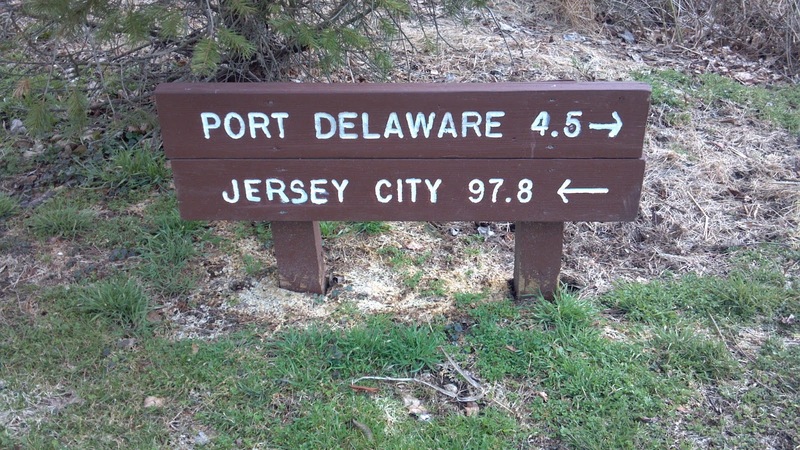 You see, to traverse its 102 mile run across north-central New Jersey, the Morris Canal had to surmount a total altitude change of 1674 feet (760 feet up from Phillipsburg to Lake Hopatcong, and then down 914 feet from the Lake to Jersey City). Canals generally use locks to float watercraft to a higher altitude or down to a lower one, as the Delaware and Raritan Canal did to overcome its 55 foot altitude change. Having to manage a lot of height in a relatively short range, the engineers designing the Morris had to come up with something much different. Sure, they built locks to handle the smaller elevation rises, but the really pronounced peaks and valleys were addressed with a system of inclined planes that made the Morris a technological marvel for its time. Plane 9W is just 4.5 miles from the canal's start in Phillipsburg. The inclined plane is essentially a big ramp with machinery that pulls the canal boat up or down a ramp and deposits it back in the canal at the other end. To start, the boat would be floated onto a cradle car that acted as a little train, hauled on tracks by steel cable wound through a pulley system. The whole thing was powered by water shunted from the canal, through an elevated flume, into a powerhouse and down a 47-foot tall chute to a large turbine. Leaving by way of an underground tail race, the water would be returned to the canal, so nothing was lost. Each inclined plane (and there were 23 of them over the route of the canal) did the work of the many locks that would be needed to make up for that degree of altitude change. The vast majority are gone now, some having been paved over as roads like Plane Street in Boonton. 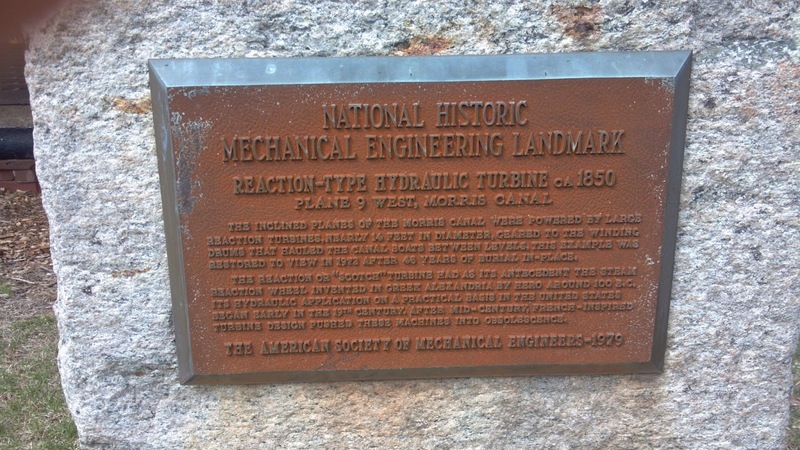 a National Historic Mechanical Engineering Landmark in 1979. The technology would have been left for history texts had it not been for a man named Jim Lee. Just after World War II, he bought the Stewartsville property on which plane 9W had stood, including the plane tender's house and remnants of the sleeper stones and cable which had been part of the site's apparatus. While the 100 foot tall incline was still there, the wooden flume and powerhouse had been demolished by the State, and much of the debris was tossed into the underground shafts, burying the turbine. Jim, his family and friends set to work excavating the workings over the course of many years, clearing out the turbine chamber and finding scores of artifacts. In the process, Jim became the foremost expert on the Morris Canal, welcoming visitors to check out the old plane and turbine room. Though he died in 2007, his family continues to share the story on the property, which is now a Warren County park. They make special arrangements for school groups and the like, but it's open to the general public only seven times a year, on the second Sunday of the month, from April to October. back out to the canal at the lower end of the plane. There's so much that makes the site cool that I barely know where to start. First off, it's absolutely mind blowing to consider the love and dedication behind Jim's work to unearth and share the story of Plane 9W and the Morris Canal. It's a huge testament to what a motivated history lover can do if he or she puts energy and persistence into gear. For someone to rescue a historic site on his own initiative, and then open it to others -- well, that takes a special person. Next, there's the interpretation of the site. We were fortunate to get a tour from Jim's grandson, Jim Lee III, who's an industrial archaeologist when he's not educating people about the canal. First sharing the history and rationale for building the canal (a story for a future Hidden New Jersey entry), he led us through the technology behind the inclined plane in a way that revealed the ingenuity behind the designers' solution to a tough problem. Even if you're mechanically challenged, you'll come away with a clear understanding and a huge respect for the canal's builders. 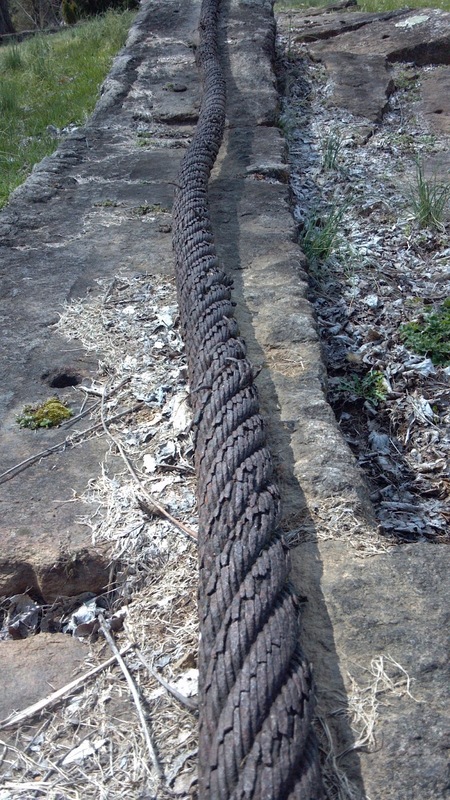 A portion of the steel tow cable. And finally, there's the ground you cover during the tour. 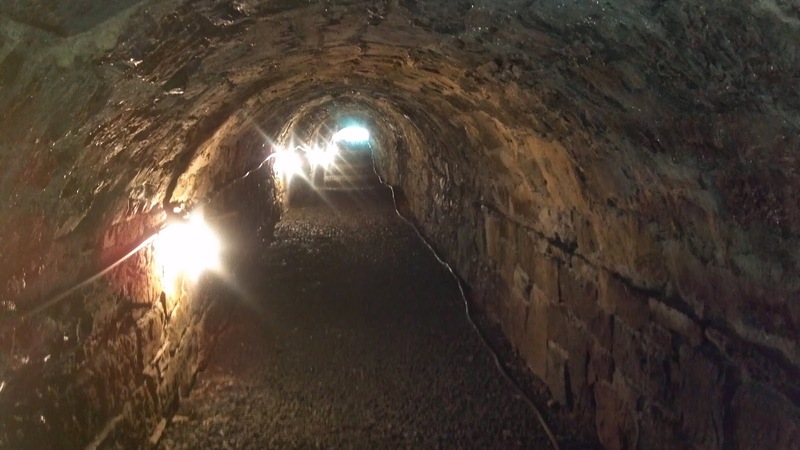 Jim brought us through the stone-lined tailrace tunnel to see the turbine underground that powered the plane's tow rope, and then to the top of the plane to inspect the sleeper stones that once acted as a bed for the cradle car rails. Remnants of the steel tow cable snake through the grass, rusted but still looking very strong. At every stop along the way, Jim gave us insights about life on the canal and its impact on the communities it traveled through. The last stop on the tour is the Jim and Mary Lee Museum, a room within the plane tender's house. While plenty of artifacts and photos are on display, I have to say my favorite was the conch that once belonged to Mary Lee's grandfather, who was one of her many relatives to work on the canal. Sea snail shells may seem out of place in western New Jersey, but they were a common sight along the Morris. Barge crew would sound the conch's trombone-like note to alert lock and plane tenders of their imminent arrival. As Jim demonstrated, they make quite a commanding sound when you blow into one end. As an appreciator of all things innovative in New Jersey, I found it heartening to see how many people stopped by to visit Plane 9 and the museum during the hour or so that we were there. Such an important site, interpreted so well, deserves a large audience. If you'd like to visit or arrange a tour for a group, check out the Morris Canal website for more information.